This post was made in a working partnership with Visit Tampa Bay. All views remain our own. Canadian winters can get cold, wet, and gloomy. It’s no surprise why so many Canadians head south for the winter. And while vacationing in Florida is a popular option for many in northern climates, the city of Tampa Bay is too often overlooked. And after spending time in Tampa with kids, I can say for sure, that this city has so much to offer families. 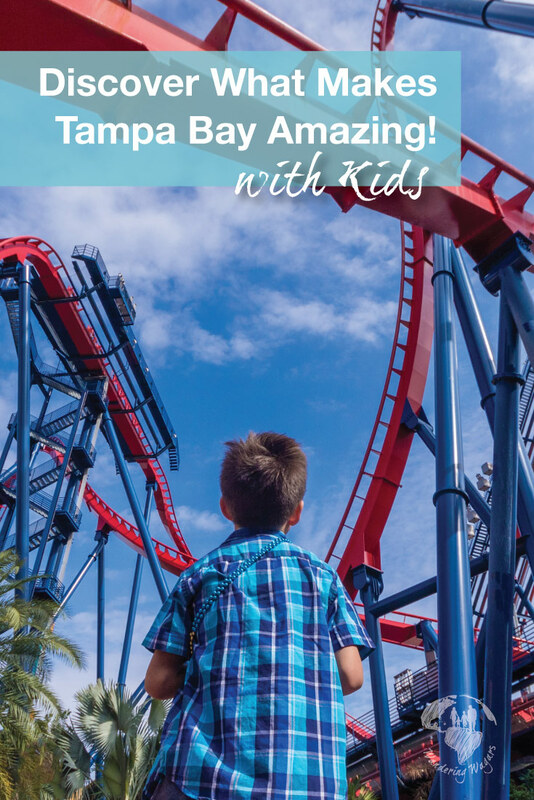 With great weather year-round, incredible attractions, and some of the most unforgettable and accessible nature attractions, finding amazing things to do in Tampa with kids is easy! The first step in finding fun stuff to do in Tampa Bay is figuring out what to do. And Tampa Bay has you covered with the Tampa CityPASS. 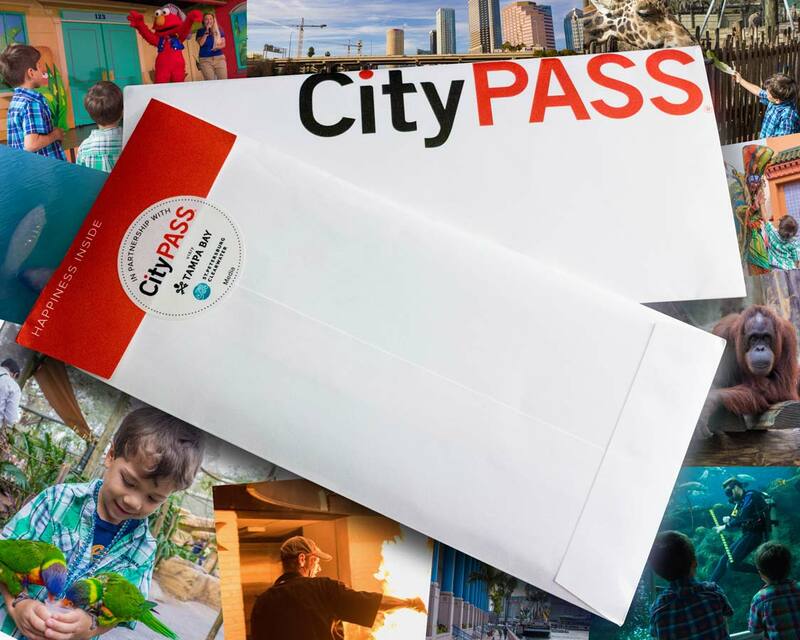 The Tampa Bay CityPASS is a booklet that gives access to some of the top Tampa Bay attractions for heavily discounted prices. 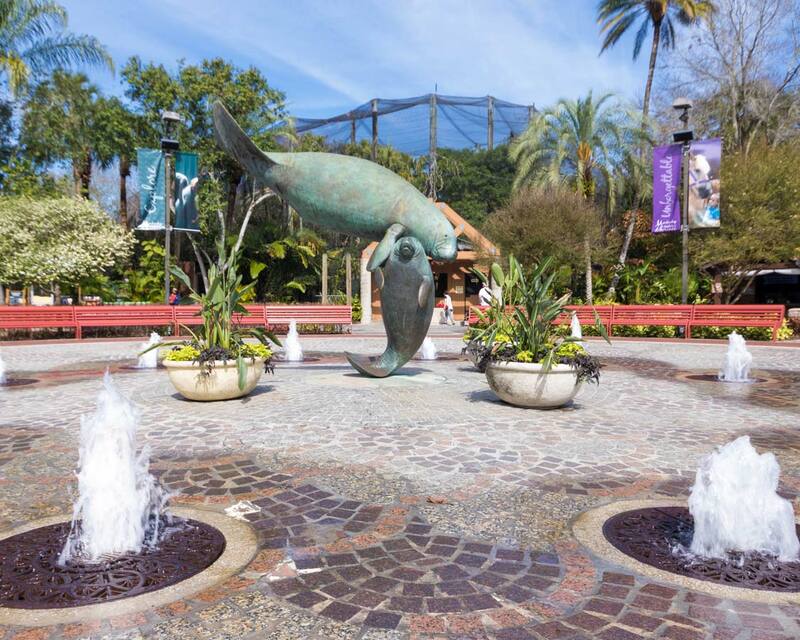 The Tampa tourist attractions include Busch Gardens®, the Florida Aquarium, ZooTampa, and the Clearwater Marine Aquarium. You can find out more about the Tampa CityPASS here. Busch Gardens was the first of the Tampa Bay attractions that we visited. 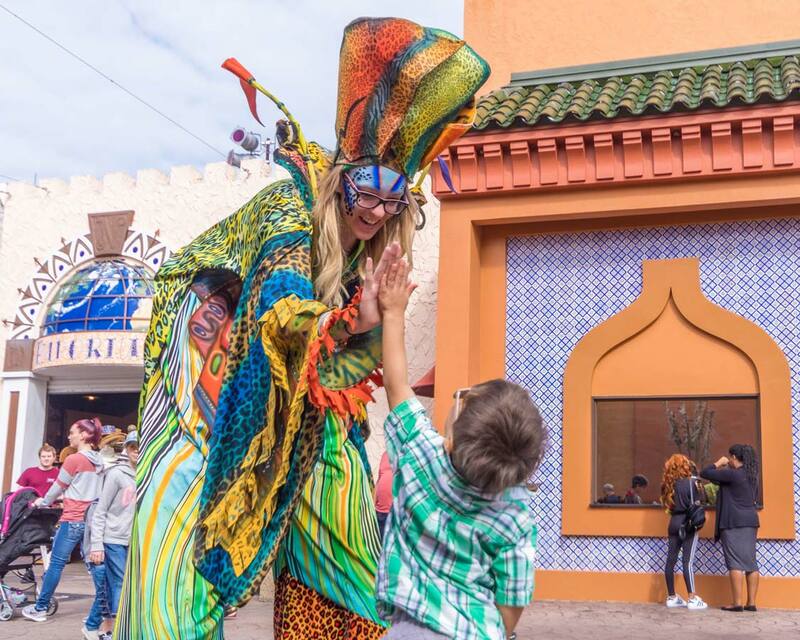 We knew how epic of a destination Busch Gardens with kids was, so we gave ourselves a whole day to take in this amazing entertainment park. 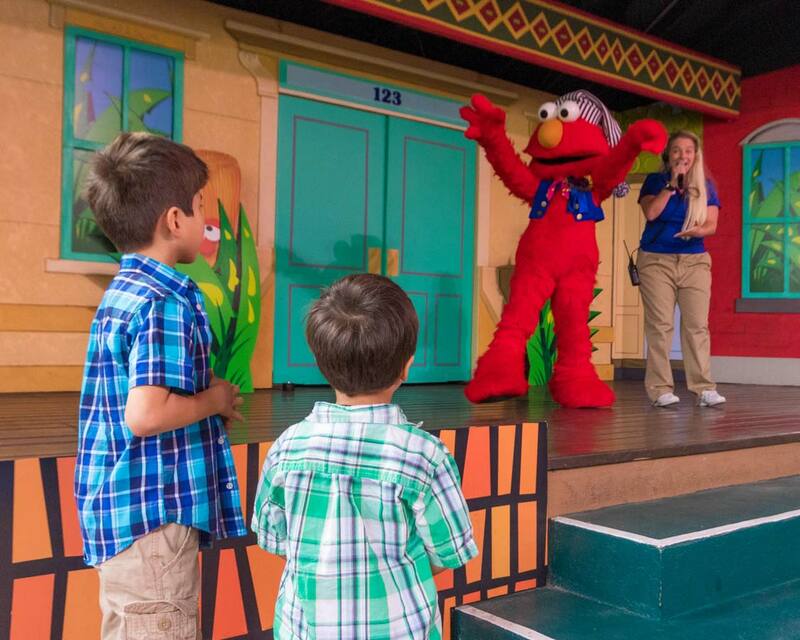 Our boys favorite part of the trip was the exciting and interactive show on the Sesame Street Safari of Fun. Getting up close and personal with some of their favorite characters was a riot. The Sesame Street Village was also filled with great rides and climbing structures that were perfect for younger children. But that wasn’t all that Busch Gardens, Tampa Bay had to offer. 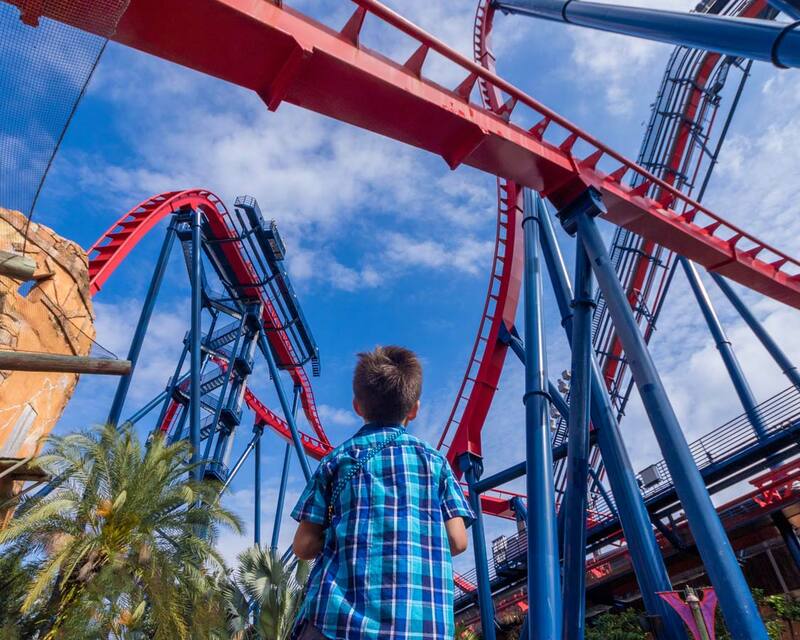 For older kids and adults, there are incredible thrill rides like Cobra’s Curse and SheiKra, as well as fun water rides such as the Congo River Rapids. While these were a bit big for our boys, they can’t wait to come back and try them next time! Busch Gardens also features a huge animal safari. With a wide array of animals such as white rhinos, elephants, and giraffes roaming the 65-acre natural habitat, a Busch Gardens Serengeti Safari or train ride (price included with your admission) is an amazing way to experience incredible wildlife up close. It was great to learn about the animal rehabilitation and re-release programs that Busch Gardens was involved in as well during our tour of the animal health center. You can find out more about Busch Gardens here. 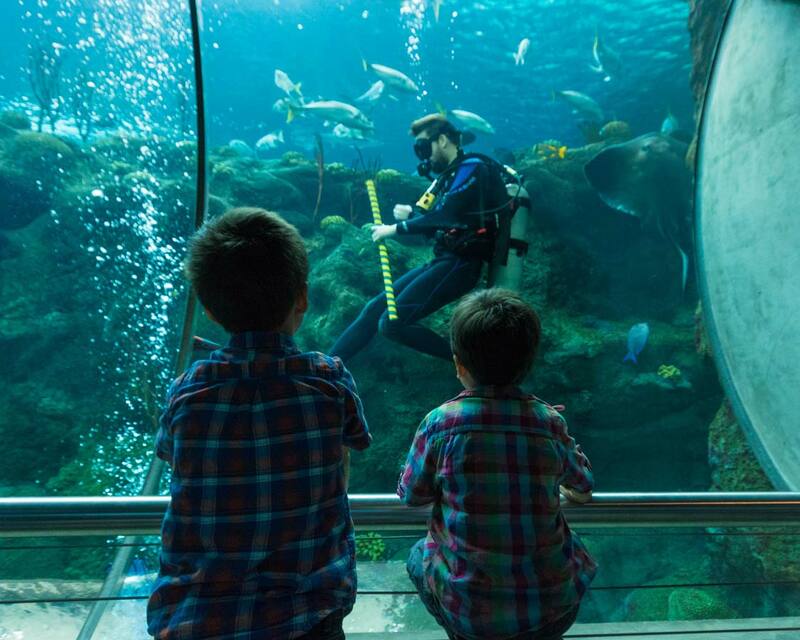 The Florida Aquarium has two levels of underwater attractions ranging from local mangroves and alligators to jellyfish and octopus. We were absolutely mesmerized by the jellyfish habitats. It was like watching a living art canvas. We also had a chance to take part in the Florida Aquarium quiz show where announcers and SCUBA divers take children from the audience and ask them questions about ocean conservation. C was called up to captain his part of the crowd and nailed the questions. We were so happy to hear it was about one of our favorite topics, animals that both eat, and poop, with their mouths! The Florida Aquarium also offers wild dolphin cruises, which is a great way to experience these incredible creatures in the wild. And as you know, we love our wild animal experiences! 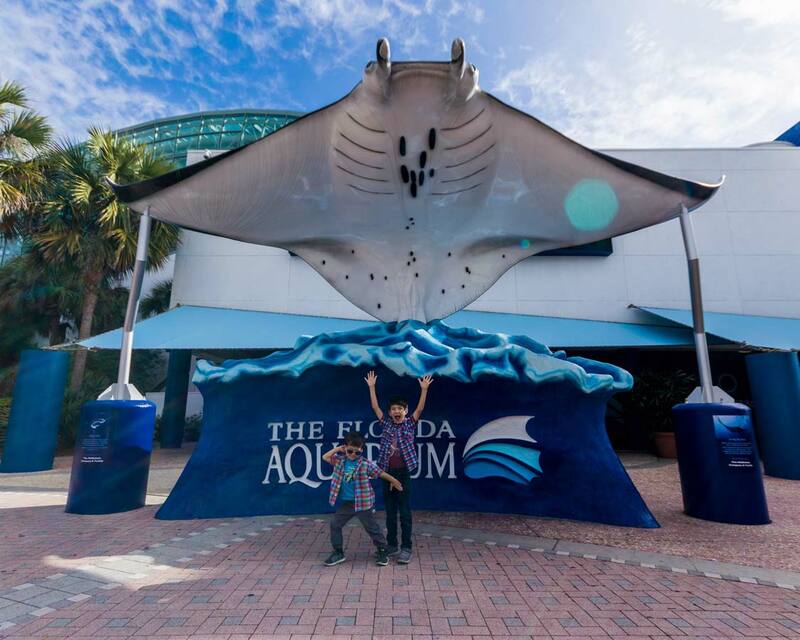 You can find out more about the Florida Aquarium here. 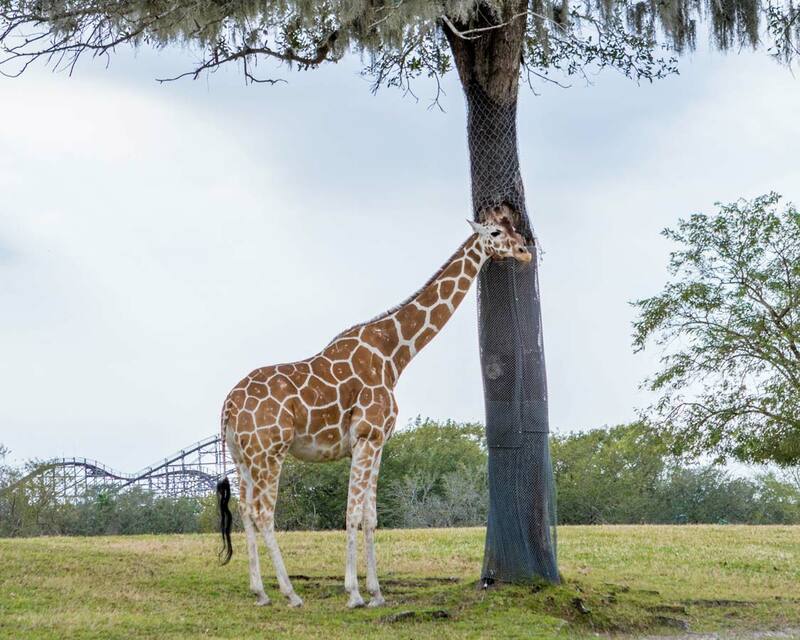 ZooTampa is another one of the top Tampa Bay tourist attractions for families. ZooTampa has a focus on animal rescue and rehabilitation. And from the moment we entered the zoo to when we left, we were treated to a thrill-ride of learning and animal interactions. 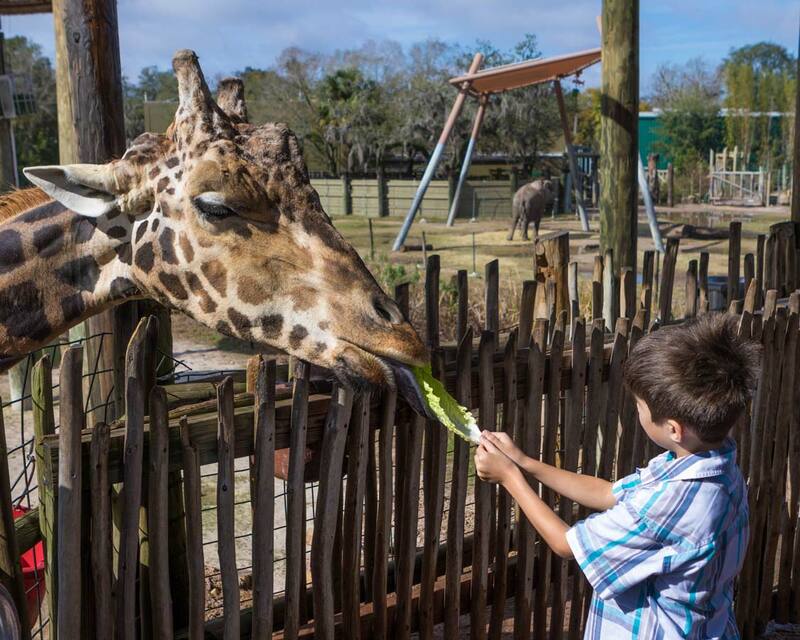 If you’re looking for kids entertainment in Tampa Bay, it doesn’t get much better than hand-feeding giraffes! And for those visiting in the hot summer, the ZooTampa offers plenty of places to cool off. There are splash pads in the children’s area to explore. Even the entrance is filled with water spilling out to help visitors cool off. You can find out more about ZooTampa here. 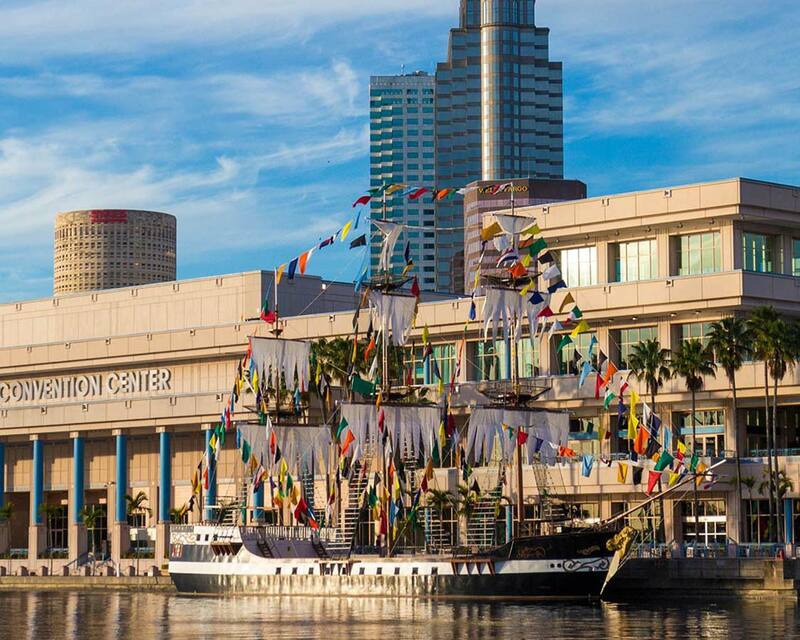 Visitors to Tampa Bay aren’t limited to activities in the Tampa CityPASS There are loads of fun things to do in Tampa or kids. Here are a few of our favorites. The Glazer Children’s Museum was a center for Tampa fun during our visit. This two-story interactive museum was filled with sensory activities that we absolutely loved. The first floor was filled with water activities and an interactive light cloud. The second floor of the Glazer Children’s Museum was where the action was happening though. 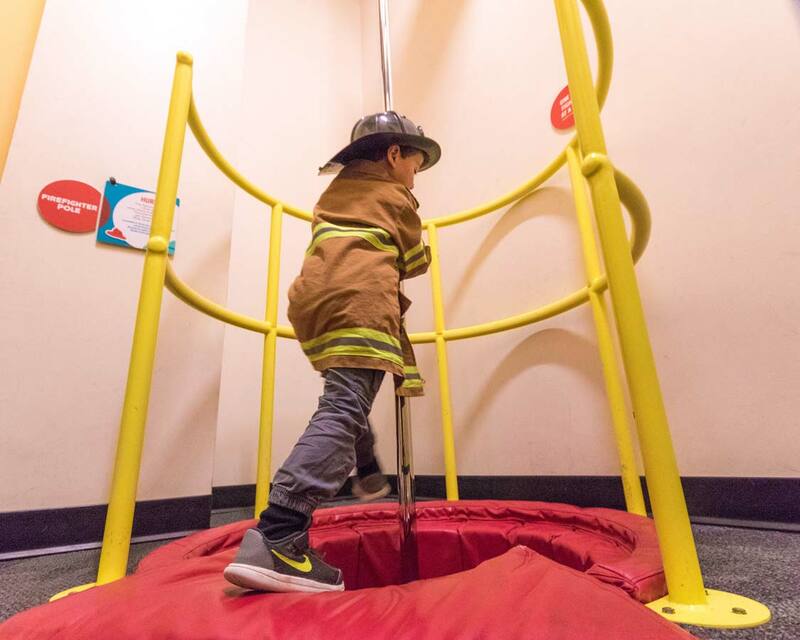 From the sports and activity center where rock climbing and racing were in full-force to the African drum circle and fire hall recreation, where dress-up and role-playing were part of the fun, the Glazer Children’s Museum was one of the best museums in Tampa Bay for kids. 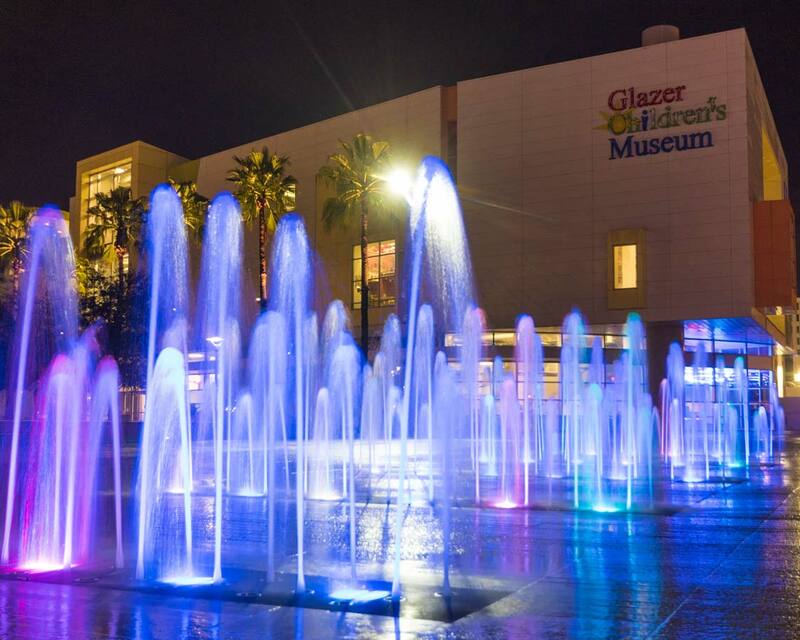 You can learn more about the Glazer Children’s Museum here. Lining the Tampa Bay waterfront is the Tampa Riverwalk. 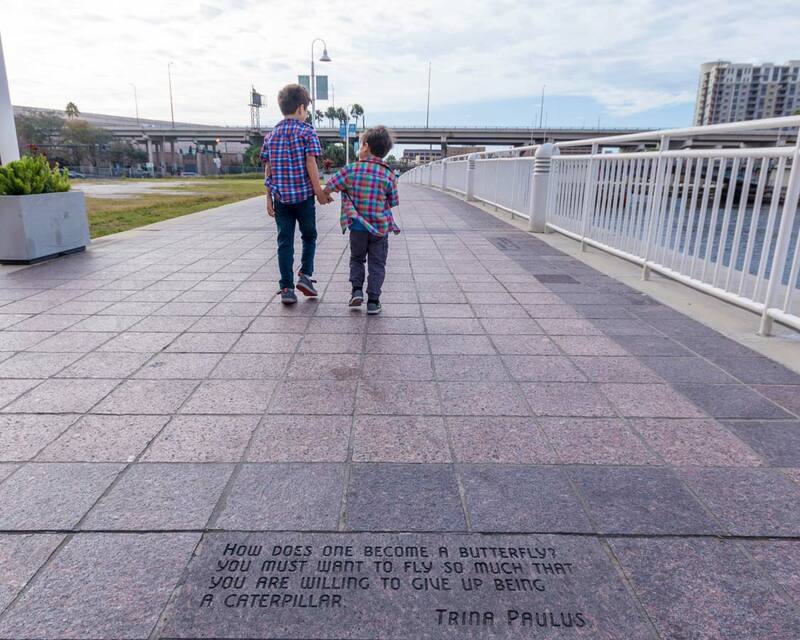 This beautiful walk stretches four kilometers along the Hillsborough River from the top of the Tampa Heights neighborhood down to The Florida Aquarium. The Riverwalk is gorgeous during the day as the trail provides information on the natural attractions of the area as well as the community’s history. 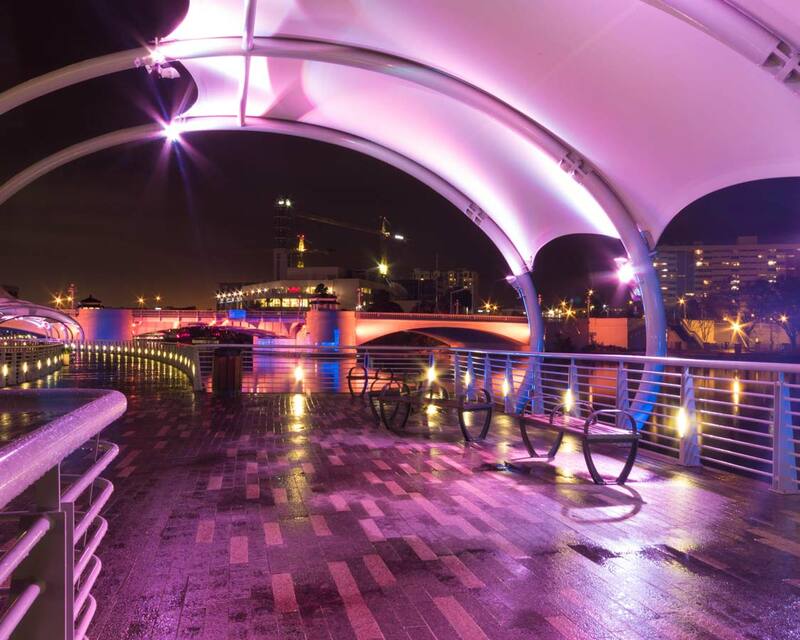 During the night, the Tampa Riverwalk is lit up in an attractive display that makes for the perfect spot for a gorgeous stroll with a backdrop of the Tampa Bay skyline. It also takes you along some of the Tampa waterfront hotels such as the Sheraton Tampa Riverwalk which is where we stayed. For those looking to get a different view of the Tampa Bay skyline, the Pirate Water Taxi is a fantastic experience. 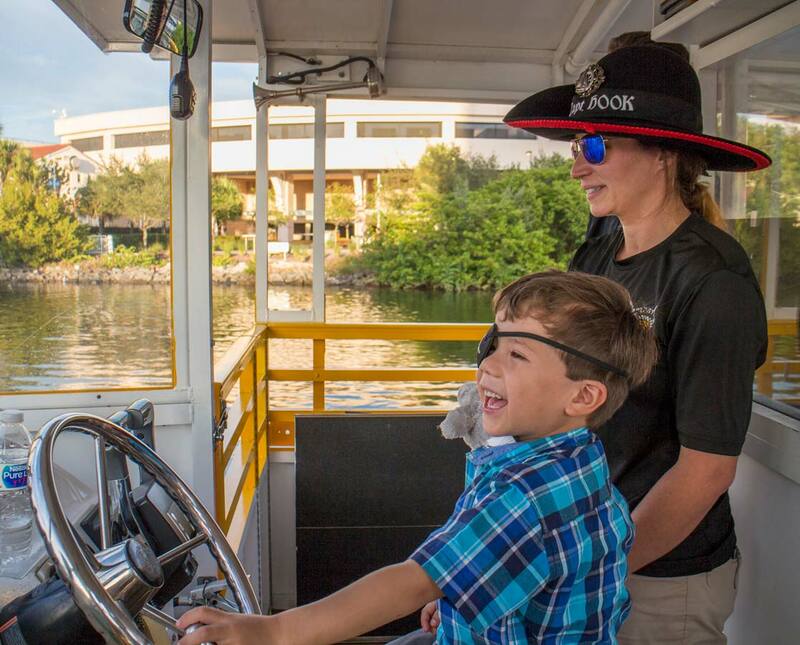 The Pirate Water Taxi is a hop-on-hop-off tour along the Tampa Riverwalk. The Pirate Water Taxi traverses the Hillsborough River making various stops along the way. The water taxi experience is fantastic for families as well. The captain’s wear pirate hats and our children were invited to help steer the boat through the channel! The Pirate Water Taxi was one of the most surprisingly entertaining things to do in Tampa Bay with kids. You can find out more about the Tampa Pirate Water Taxi here. One of the fun things to do in Tampa Bay for kids is seeing the Manatees. These gentle giants can be found throughout southern Florida, but are shy and can be hard to find. But we arrived at the perfect time of year. 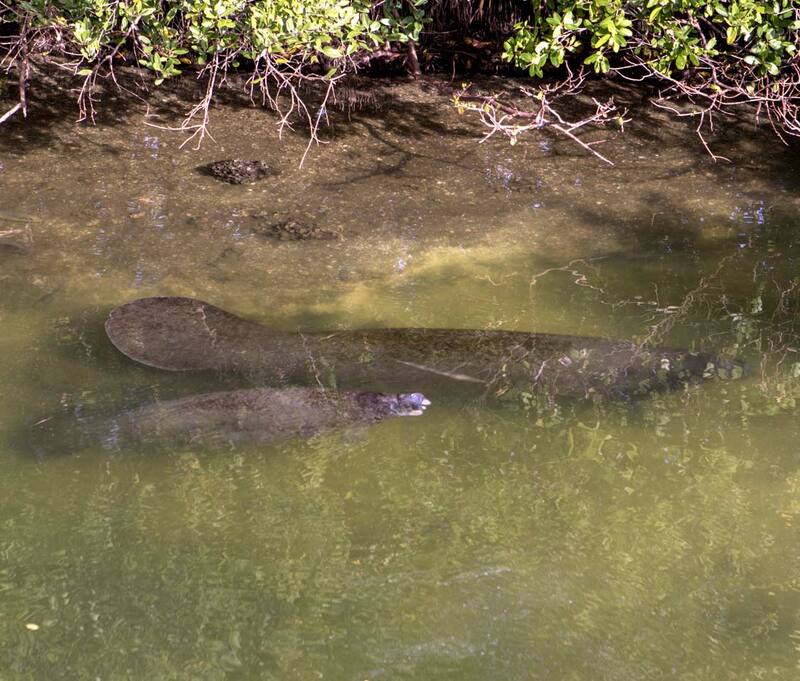 When the temperatures in Tampa Bay drop below 63°F (17°C), manatees flock to the Tampa Bay Electric Company (TECO) to warm up in the clean water discharge. But manatees aren’t all that was on display at the TECO viewing center, we also saw eagle rays, loads of fish, and even groups of black-tipped reef sharks hunting for prey. The best part about TECO is that it’s free. It’s one of the top cheap things to do in Tampa Bay for nature lovers. 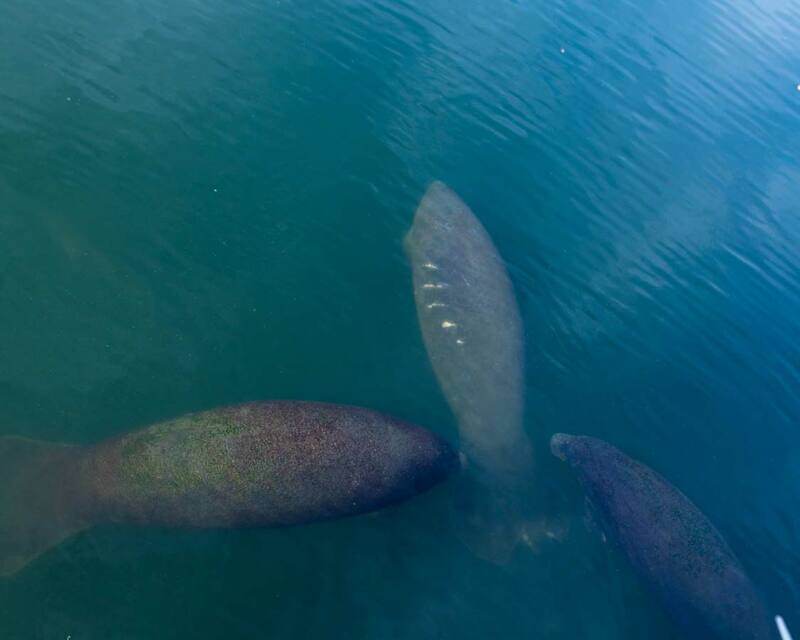 You can find out more about the TECO Manatee Viewing Center TECO here. Combining fun things for kids in Tampa Bay with great food, Ulele restaurant is a perfect dining spot for families of all ages. They have rescued and restored fairytale sculptures from the park near ZooTampa. The sculptures now dot the property of the restaurant along with sculptures representing the story of how the restaurant got its name. 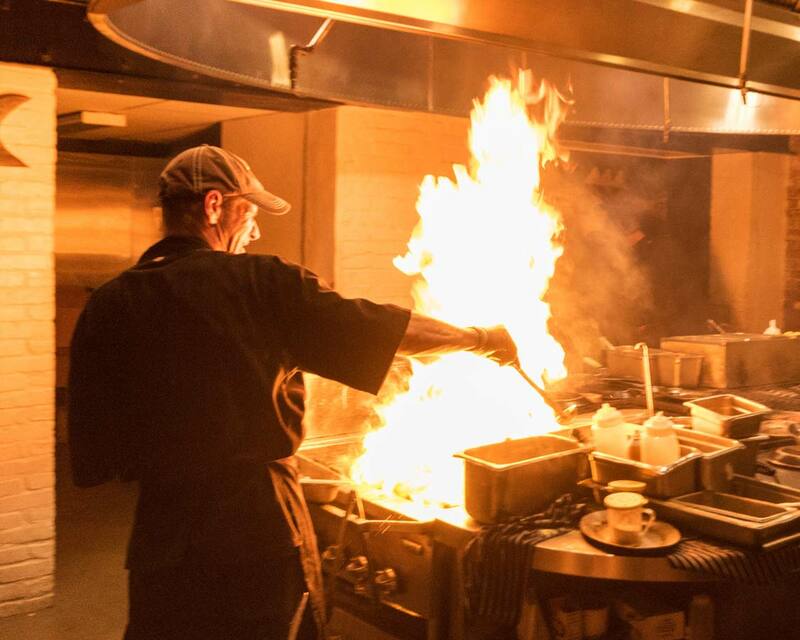 You can learn more about Ulele here. The food and service at Ulele were top notch and the open kitchen was a hit for all of us, especially when they fired up the house oysters. Tampa Bay Florida should be on every sun seekers radar. We arrived in the city wondering if this city could live up to some of our past adventures, and we left wishing we had more time to explore the amazing Tampa attractions such as catching a show at the beautiful Tampa Theatre, embarking on one of the famous Wild dolphin tours or taking in the views of the gorgeous Sunshine Skyway Bridge. 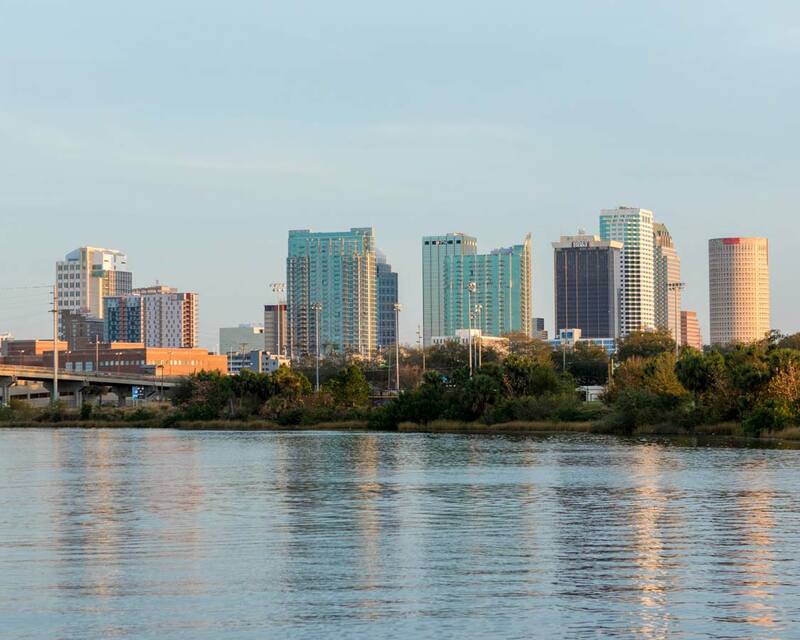 Have you ever been to Tampa Bay, Florida? Tell us about your favorite experiences below, or contact us to let us know your experiences. Disclosure: This post was made in a working partnership with Visit Tampa Bay. As always, our views remain our own. Wandering Wagars is a participant in the Amazon Services LLC Associates Program, an affiliate advertising program designed to provide a means for sites to earn advertising fees by advertising and linking to amazon.com, amazon.co.uk, amazon.ca. Amazon and the Amazon logo are trademarks of Amazon.com, Inc. or its affiliates.